Bummed from my disappointing week and feeling the effects from skipping too many meals and eating irregularly during the week, I devoted some time on Saturday evening to making a good dinner. I had a mango and two plantains that I had purchased for experimentation, and they were starting to get the point of either use or refuse. 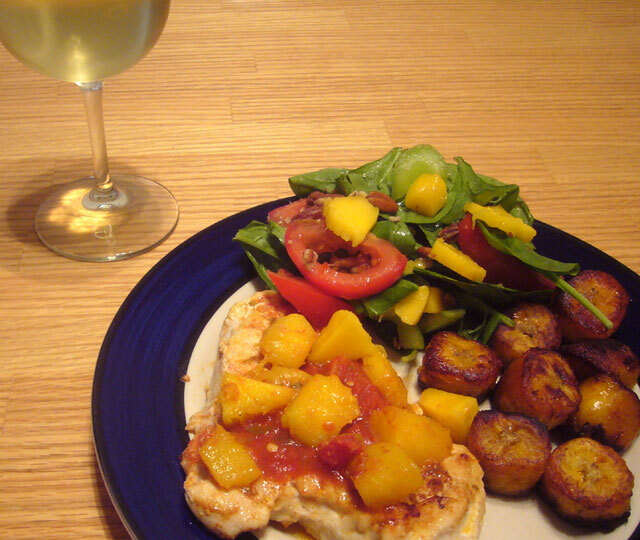 Examining the other contents of my fridge and freezer led me to my creation: mango salsa chicken, fried plantains, and a fresh spinach salad.